Make an Excel spreadsheet. Seriously. It will save you tons of time and stress. I made two spreadsheets: one for volunteer/work hours, and one for observation hours. 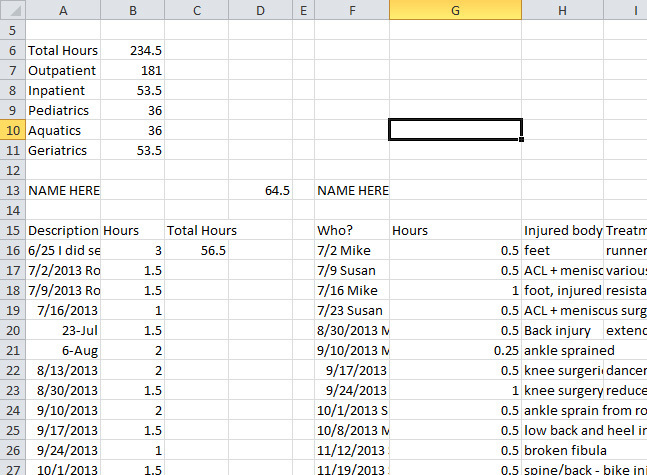 The volunteer/work spreadsheet looks similar, except I included fewer details. I recommend starting this as soon as possible, so you won’t forget anything. The PTCAS application will specifically ask for start and end dates, total hours, and approximate hours a week. I included the name of the facility, the hours, date I volunteered, and anything cool that I observed that day. The notes especially help when writing personal statements and preparing for interviews because they give you personal experiences to talk about. To calculate the total hours: Click on the box where you want the total hours to show, and enter in this formula: =SUM(A1:A5). This will add all the numbers in the boxes A1, A2, A3, A4, and A5. How did you organize your notes? Please comment below!